Our previous guides regarding mining and using Ethereum’s Ether (ETH) coins were based on the Go Ethereum implementation (source) as we find it easier to be used than the C++ implementation of the Ethereum client (source) even though we are actually using ethminer for the actual mining which is a part of cpp-ethereum and not go-ethereum package. The Go Ethereum implementation (geth) only comes with built in support for CPU mining, while the C++ implementation (eth) contains support for OpenCL GPU mining both as a part of the client as well as a separate miner (ethminer) and there is also a fork of ethminer with CUDA support available (source). So now it is time to get started with using the cpp-ethereum (eth) client for creatng a local wallet and for mining both solo on a local system or on an Ethereum mining pool using eth and ethminer. Our guide is for using eth and ethminer on Windows with binaries provided only for that OS (version 0.9.40 64-bit), though the usage should be the same or very similar on other operating systems, but you will need to compile or get binaries for the respective OS. We have tried to make the guide easy and simple to follow, so that you can begin using Ethereum and mining Ether in just a couple of minutes. First we need to create a local wallet and this is the first thing you will do when you run the eth client software. But before that a word of warning, if you have a working geth installation you should know that both Ethereum clients will use the same folder for the blockchain data by default, though the contents of the folder will not be compatible. 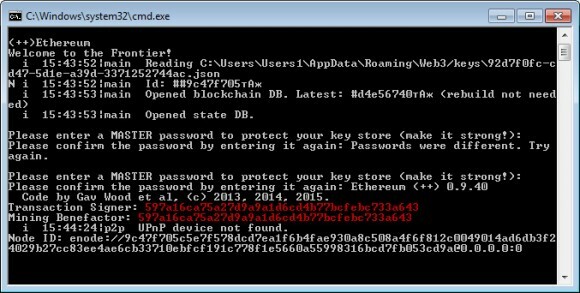 The key files that are needed for you Ethereum wallet however will be stored in different places and each client will use ts own wallet, but we’ll get back to that in a minute. If you want to have two independently working installations of geth and eth, then you might want to use the --datadir parameter for geth or the --db-path for eth to specify different folder for the blockchain data for one or for both applications. With the eth client you would need to run a separate executable in order to get access to the console and be able to type in commands such as to see your wallet address or balance or to send coins to someone. In the geth client for example the console is built in and you can access it if you invoke it through a command line parameter when running the geth client. With the eth client you need to have the client running with eth-start.bat and then you need to run the eth-console.bat to access the console. You should run the console via the provided BAT file instead of directly through ethconsole.exe even though there are no parameters being sent via the batch file, the reason for that is that if you run the EXE file directly you will not be able to copy and paste into the console. Another difference in the eth client console as opposed to the geth client is that here there are no shortcuts that can save you time when typing commands, you need to type the full commands here in order for the eth console to do what you need. In the screenshot above you can see that we have typed eth.accounts in the console to see the wallet address, but got an error, even though this command works just fine in the geth client’s console. 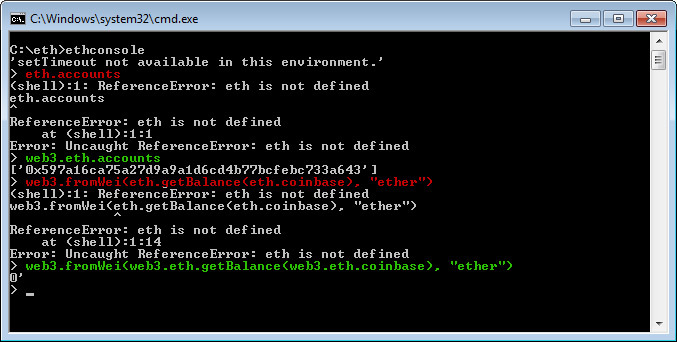 This is because geth has the eth as a shortcut for web3.eth, but using the eth console you need to type the whole thing as there are no shortcuts, so typing web3.eth.accounts will work, the same applies for other commands that use shortcuts that work just fine in the geth client as they will not work directly in the eth console. Next up is mining with eth and ethminer, if you’ve followed our guides for using geth then you will probably already be familiar with the use of ethminer for solo mining as well as for pool mining. The pool mining part is the same here, but we are going to cover it anyway for the people that are new to using ethminer. The Windows binary package available for download below that you can use to get started contains eth as well as and ethminer for OpenCL and CUDA, do note that you can also use OpenCL on Nvidia GPUs and not only run them in CUDA mode. And while the geth client contains build in mining option that can only use the CPU, the eth client comes with a build in functionality for mining both with the CPU and OpenCL (the same mining functionality that is made available thorugh ethminer). The example BAT files contain the pool information, you will need to enter your wallet address as well as to modify the pool difficulty if the pool supports it (only nanopool does not). Have in mind that currently ethpool is not accepting new miners, so you will need to use some of the other two pools available if you are just starting with mining. You can also check our guides for pool mining with geth and ethminer as well as the other one for solo mining with geth and ethminer if you are interested and decide which one works for you better. Dear, one question. There’s something for Windows 32 bit? No 32-bit version is available, only 64-bit for Windows. Google is reporting it as it thinks that all miners could be potentially dangerous software, it is actually not reporting that particular file, but the folder where we store the crypto software we make available for download. Keep up the great work, this site is awesome! Really, great work!! I like so much this site. Thank you for everything. This site is really cool. Hi, in the “how to”, to generate a new wallet it is written to run the “provided” eth-start.bat, but I don’t find it. Where can I get it? This guide is for using cpp-ethereum, and not geth, so you need to download the downloadable package provided here. Alternatively just run: eth --frontier -i -b -v 1, but you still need to have the eth client. You’re right. I downloaded the wrong package. Sorry. Thanks for you quick answer. I get: ‘setTimeout not available in this environment’ when I run console. Also the same error when building wallet, but the wallet seems fine and is updating. Console commands work. However when I get to mining it instantly fails with a msg saying my GPU doesn’t have enough memory. Will this only work on 2GB GPU’s ? The setTimeout error seems to be normal on Windows. Mining Ethereum does require a GPU with 2GB of VRAM as a minimum. One more question , if I have a json file from the crowdsale, how can I import that into my eth wallet in windows? Link? Allocating/mapping single buffer failed with: clCreateBuffer(-61). GPU can’t allocate the DAG in a single chunk. Bailing. The -i option has been removed in the newer versions of the client, so you can just remove it. Using Windows 10 64 bit, Eth will not start. Make sure you are downloading the latest ETH client, this post has been outdated… use the links to the latest code. By cpp-ethereum contributors, (c) 2013-2016. See the README for contributors and credits. Hi I have been trying to mine using ethminer and dwarfpool. Everything is synced and GPU is working but I am getting error 32603 -failed to submit hashrate – any ideas on a fix? Any idea why I did wrong ? I use Radeon rx 560 gpu. When I launch eth for mining i receive a message like this: no gpu device with sufficient memory was found. Can’t gpu mine. Remove the -G argument. Do I have a good graphic card to mine? Why I’m unsuccessfull to mining? Is the graphic card too powerless? disculpe ya descargue el cliente Ethereum pero no aparece ningún archivo eth-start.bat por ende no se como iniciarlo ya descargue una versión más actualizada y tampoco y la verdad ya me estoy estresando. Si podrían ayudarme les agradecería muchísimo. Mine crashes at DAG Generation Failure. Reason: Invalid argument. I have the same issue. win 7 x64 up to date. Probably we should install some c++ redistribution package? On running eth-start.bat I am getting the following problem, any ideas ? It’s possible mine with ethermine in this site?